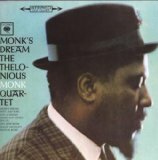 Monk's Dream is ranked 2nd best out of 37 albums by Thelonious Monk on BestEverAlbums.com. The best album by Thelonious Monk is Brilliant Corners which is ranked number 804 in the list of all-time albums with a total rank score of 3,136. Members who like this album also like: Kind Of Blue by Miles Davis, A Love Supreme by John Coltrane and The Velvet Underground And Nico by The Velvet Underground And Nico. Related links: top tracks by Thelonious Monktop tracks of the 1960s, top tracks of 1963. Showing latest 5 ratings for this album. | Show all 145 ratings for this album. Monk was certainly a musician's musician. One of the greatest to ever do it. Definitely deserves its spot up with the Jazz essentials. Just so much to take in. Monk's first album in 2 years and his debut with Columbia. Classy and enjoyable fare. Repays the dilligent listener.